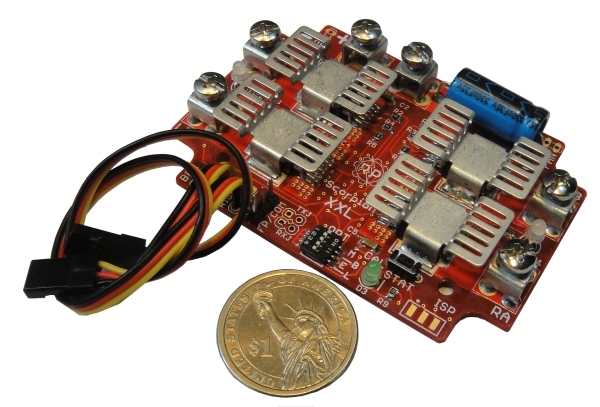 The Robot Power Scorpion XXL is a flexible high-performance two-channel motor controller for small to medium mobile robots such as competition firefighting robots, sumo, robotic combat, theater props, inspection and other applications. It may be used on robots up to as much as 90 pounds or more as long as the motor current limits are respected. The Scorpion XXL is suitable for other applications as well including lights, hydraulic valves and other static non-robot uses. Full current limiting and over temp limiting. Nearly blow proof! Receiver battery eliminator circuit (BEC) standard � may be disabled. This can provide up to 200 mA of current at 5V to the RC receiver and other attached electronic circuits. An optional plastic enclosure is offered to protect Scorpion XXL from environmental contamination. The enclosure is also used to mount the cooling fan for the XXL. 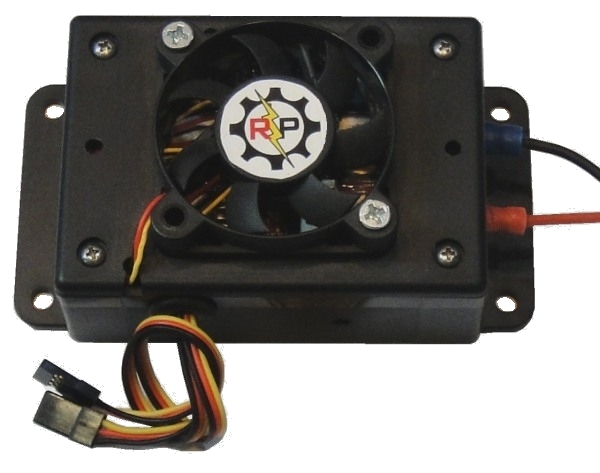 The enclosure and cooling fan are offered as user-installed kits. The user is free to customize them as needed for the individual application. The Scorpion XXL software is designed to work with most R/C systems out of the box. The most common options are set up as the default so no complicated configuration, calibration, or programming is required. The controls shown in the image above, left to right, are: BEC jumper, RC wires for Steering/Throttle or Right/Left channels, Option DIP switches, Status LED and the Calibration button. Mixing - Switching the "M" switch to ON activates channel mixing. This function allows one radio channel to be used as the "throttle" control and one as the "steering". This allows driving of differential drive robots in a natural and intuitive way using a single transmitter stick. The OFF position allows independent control of each motor output. This is also known as "tank" mode. Tank mode is also suitable for programmed control by microcontrollers etc. which can do any needed channel mixing internally. Brake/Coast - Switching the "B" switch to ON activates Brake Mode. In this mode the motor leads are shorted together when a zero speed is commanded. This provides a strong electromagnetic braking action to the motor. The OFF position activates Coast Mode. In this mode the motor leads are disconnected at zero speed. This allows the motor to more gently coast to a stop. The physics of the individual application will decide which setting is best. Exponential - Setting the "E" switch to ON actiates Exponential mode - OFF activates Linear Mode. In Linear Mode at 50% stick throw the output voltage will be set to 50% as well. Under Exponential Mode the output response is related to the input via an exponential curve . This allows a softer response around the center point while still giving full power at the extremes of the control range. This setting helps when driving robots by eye as it makes control smoother when giving small control inputs. Throttle response is always linear. In Tank Mode both channels have exponential response. Lipo Cutoff - the "L" switch controls the Lipo battery safety cut-off feature. When switched ON the Lipo cut-off is activated if OFF the battery voltage is ignored. Lithium chemistry batteries can be damaged if they are over-discharged. The Lipo cut-off feature will disable the outputs if the battery voltage falls below 3.0V per battery cell. The system determines the cell count at power-on and calculates the cutoff voltage from that. If the battery is mostly discharged when the unit is powered on an incorrect cell count may result and the cut-off function may not work properly allowing excessive discharge of the battery. 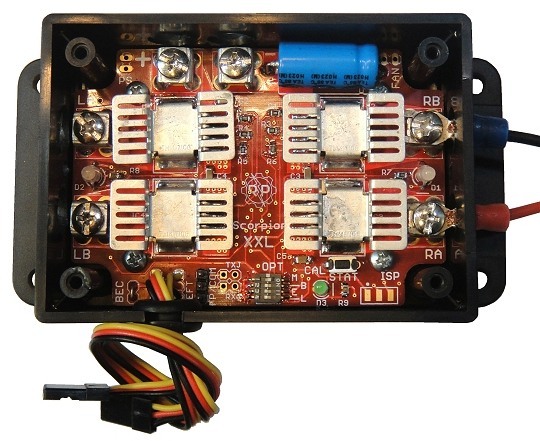 BEC - the internal 5V regulator on the Scorpion XXL is connected to the power wires on the servo leads by default. This allows the Scorpion to provide power to the R/C receiver or other external circuits and eliminates the need for an external R/C receiver battery. Cutting the BEC jumper on the PC board disables this function and allows a separate 5V supply to power the R/C signal source (receiver or microcontroller). Calibrate - a pushbutton switch is provided to activate the Scorpion XXL calibrate mode. This mode is used to map the radio or other RC signal source to the full range of motor outputs. The range of values sent by the radio system or microcontroller is recorded and the Scorpion XXL stores the values in non-volatile	memory and retains them permanently. It is also possible to reset the values to the factory defaults. Flip - Certain robot applications need to reverse the forward/reverse response under user control. The most common situation is when the robot is flipped upside down. If the control response is not reversed driving is very difficult as the robot responds in a reverse direction to normal control inputs. By default the Flip function is controlled by an R/C channel. The landing gear switch on an aircraft style radio or the 3rd channel on a pistol style are commonly used to activate this function. An alternative configuration is to use a binary signal to activate the motor flip function. In this configuration a switch is connected between the signal wire and the ground wire on the Flip R/C lead. When the switch is closed the flip function is activated. A logic level input from a microcontroller may also be used as long as the two units share a common ground wire. A Documentation for the Scorpion XXL with details on setup and operation of the controller will be available soon from the downloads page. Contact us for any detailed questions about setup or use of the XXL. Robot Power offers the Scorpion XXL in fully assembled units ready to install and use. Check the Web store for details on prices and special offers.